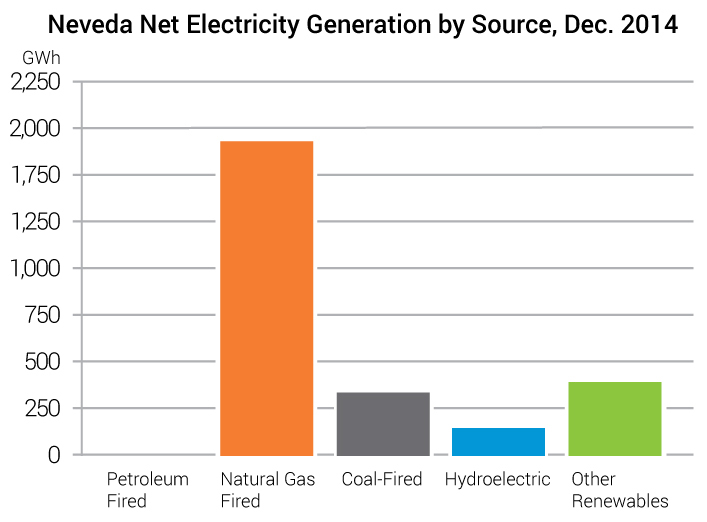 With high-energy demands, Nevada has a need for clean, renewable and reliable energy. From casinos in Las Vegas to hotels, tourism is one of Nevada’s biggest industries and it’s imperative to meet the energy needs of both tourists and Nevada residents. With Nevada’s dry and sunny climate and vast desert landscapes, using solar power as a main renewable energy source is a natural choice. Nevada has, per capita, the most solar panels and grids installed among all other states in the U.S. 84% of Nevada residents approve of efforts to increase solar energy production. Current energy rates are high, especially when considering the summer months, where residents rely extensively on air conditioning. 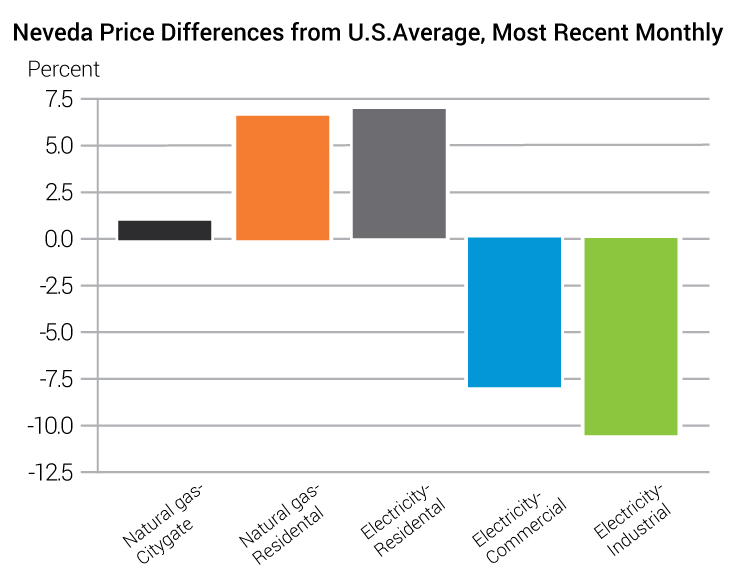 On average, power in Nevada can cost up to $.13/kwh. Find out more about solar costs and savings – talk to our recommended Nevada solar installers now to see your savings. More and more Nevada residents are adopting solar panels. Nevada is right on track to meet its Renewable Portfolio Standard, which is calling for 25% of Nevada’s energy to be produced via renewable energy sources by 2020. Half of Nevada’s renewable energy is to come from residential customer service locations. This means that private residents should expect to receive more solar power benefits over the years as opposed to these rebates going to private companies alone. 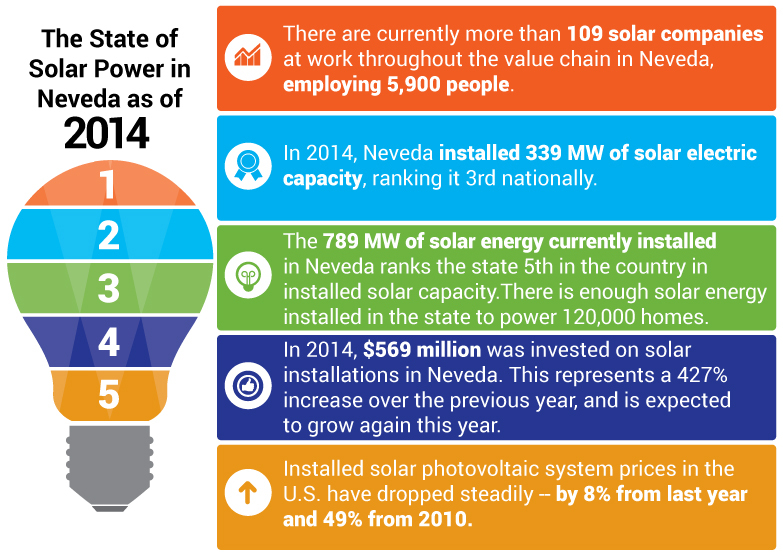 5% of Nevada’s total renewable energy production is to come from solar energy. Nevada’s vast solar power plants, such as the Ivanpah Solar Electric Generating System, help meet these goals. Nevada even sells a lot of the solar energy it produces to California, helping both states meet their own renewable portfolio standards. Programs like the Nevada Renewable Generations program feature incentives for both homeowners and small businesses. In fact, in 2015 alone, over 1,987 residents applied for solar rebates between January and March, versus 1,242 applications made in all of 2013. The average cost of electricity in Nevada is $.13/kwh. Many residents of Nevada often find that they use more energy using certain high capacity months, such as summer, when they may have to rely on features such as air conditioning. It’s no wonder people in Nevada want to save money on their power bills with Nevada solar panels. Even shaving a few dollars off of your power bill can help you save a significant amount of money in the long-run. The average homeowner with a solar panel can expect to save up to $36.44 a month. By reducing dependence on the grid, homeowners can significantly cut their power bills. And through net metering, which is a system that credits solar panel owners for the power they contribute to the grid, you can earn credits on your power bill that can be redeemed at any time. You can speak to one of our certified and recommended solar installers today to find out how much money you can stand to save each month. In a recent study, the Lawrence Berkley National Library collected data over 11 years concerning homeowners in eight states. They concluded that, on average, homeowners can expect to add up to $15,000 to their home’s value. Often, many buyers are willing to pay more if a home comes pre-installed with a roof-panel solar energy system. In fact, one study found that homeowners could sell their homes 20% if they had a solar panel installed on the roof. On average, a solar panel system can help offset about 100,000lbs of carbon dioxide over its life time, which is equal to the amount of carbon dioxide produced by a car driving for 100,000 miles. A study cited by the Las Vegas Review Journal and commissioned by NV Energy found that homeowners who don’t install solar power systems wouldn’t face any significant costs if their neighbors install solar panels. It’s not just private citizens getting in on the action. The Las Vegas Valley Water District recently adopted a solar power solution to help distribute water around the area. The panels helped reduce the agency’s dependency and strain on the grid, as well as ensuring no water was used in producing energy. Non-profit organization Black Rock solar was able to help a number of schools, non-profits, and Native American tribes save up to $547,000 on their electric bills through solar panel installations. One food bank featured in the report, because of the money they saved on electricity, was able to provide 99,000 more meals for families each year. Many people who may be thinking of installing a solar panel may be thrown off by the high cost of Nevada solar energy systems. However, the price of a solar panel doesn’t necessarily have to discourage you. You may want to consider leasing your system. Leasing a system can enable you to obtain a solar power system with zero money down. It can be an affordable and easy way to save money now and help you avoid paying significant upfront fees that you may face from buying the system outright. However, you will need to consider how much a leased system may cost you over the long-run. Lease payments are often $100 a month. Over time, you may spend more on a leased system than you would by outright buying it in the first place. Still, it can be an option worth considering if you don’t have the ability to pay for a solar energy system upfront and want to enjoy the benefits of a panel almost immediately. Every location and situation is different when it comes to solar power. To find out exactly how much you can save, and how much the PV system will cost you, talk to one of our recommended local installer in your area. it’s free, with no strings attached and you can get an accurate solar quote instantly. Everyone in Nevada knows that air conditioning is just one of the many expenses that one has to contend with throughout the year. Installing a solar panel can help you cut down on your utility expenses. Along with helping you cut down on utility expenses, you can also benefit from many of the rebates and incentives available to solar panel owners in Nevada. The Nevada Energy Renewable Generations program features incentives valued at up to $13,500 for individuals and up to $67,500 for small businesses. In previous years, homeowners would have to apply through a lottery system but the lottery system has since been discontinued. Interested applicants are encouraged to apply until the program’s funding runs out. You can enjoy the 30% Federal Solar Tax Credit, which is set to run out in 2016. This allows you to claim 30% of the cost of the solar energy system as a tax credit. If your solar panel was installed before the end of 2016, you’re eligible to redeem this incentive. Nevada property owners can receive a property tax exemption for 100% of their solar power system’s value. This exemption can be redeemed any year after the installation of the system. This, however, can’t be claimed if the resident has already claimed another property tax exemption on the building. Nevada has no sales tax so residents won’t be able to redeem a sales tax exemption on their solar energy system. 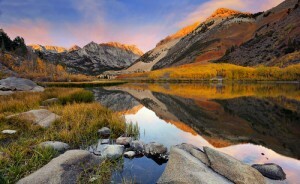 Is it Worth Investing in Residential Solar Energy in Nevada? Many Nevada residents wonder if getting a solar energy system for their home is worth the investment. Situations may vary, simply based on your personal energy needs, but for the most part many people find that a solar power system is a good investment. Depending on your solar PV system quotes, you may even begin to see returns immediately. Be sure to get in touch with your local solar energy system installers to see how much you stand to gain from the investment. Most solar energy system leases last as long as 20 to 30 years on average. However, one should keep in mind that many of the incentives, tax credits and exemptions may not be available to individuals who lease their solar systems. However, leasing a solar energy system still means you can save money on your power bill and reduce dependence on utility companies, depending on your own individual energy needs. Leasing a solar energy system means you’ll only need to make payments on the system and any energy you need to purchase from the utility company, which can save you a significant amount of money in the long run either way. You’ll also have the option of obtaining a solar lease with no money down. This is a great way to enjoy the benefits of solar energy without having to pour thousands of dollars into purchasing the system outright. Later on, you can even choose to purchase the system once your term expires. Along with the grants and incentives from the Nevada Energy Renewable Generations program, homeowners can also expect to enjoy a property tax exemption and the 30% Federal Solar Tax Credit. While you won’t be able to enjoy these benefits forever, especially when funding runs out for the Nevada Energy Renewable Generations program and the 30% Federal Solar Tax Credit expires, you’ll always be able to enjoy the property tax exemption and any money you can save from producing your own solar energy. Should I Lease Or Buy the PV System Instead? Whether you lease or buy a solar energy system in Nevada depends on your own personal needs. Consider your personal solar PV system quotes and get in touch with a solar installer to figure out what’s right for you. Buying the system upfront may save you more money in the long-run and allow you to personally enjoy the various incentives available to homeowners and small businesses but leasing the system means you can own a solar energy system for zero money down- making it an easy way to enjoy the benefits of renewable energy immediately. What About Nevada Net Metering? Net metering is one of the biggest benefits that comes with installing a solar panel system. 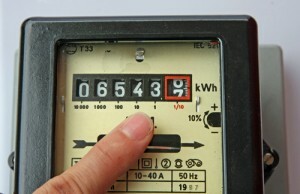 Net metering means that your solar system will be connected to the local electricity grid. Any surplus energy your solar panel system produces can be later redeemed as credits on your energy bill, allowing you to cut the cost of your energy bill at any time that your account is still active. All residents who install a solar energy system will need to be signed into the grid and will be eligible for the net metering program. While not everyone can expect to eliminate his or her electric bill entirely, net metering can significantly reduce your power bill overtime. And by redeeming credits on your energy bill, you may be able to pay off your energy bill almost entirely, which can be extremely beneficial during high traffic months such as summer. Using solar energy is a great way to become less dependent on the energy grid. Nevada’s climate primes it well for adopting solar as a renewable energy source. There’s never been a better time for residents to consider a solar system installation. Residents with a solar system can expect to receive cash incentives, as well as property tax exemptions and federal tax credits. As such, they can be a great investment for many people. Renewable energy also benefits the environment. By helping reduce carbon emissions, solar energy is a great way to take advantage of Nevada’s ample sunlight. They’re quiet and produce clean energy throughout the year. And considering the fact that Nevada experiences at least 300 days of sunlight per year, you’ll have a significant part of your energy needs met through solar energy most of the year. Installing a roof-top panel is a great way to offset both carbon emissions and your own usage, from air conditioning and more. Talk to a trusted solar panel installer we recommend and see your solar savings today!